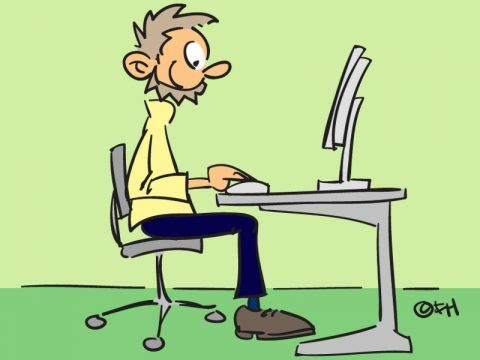 Home » Personnel » Working conditions » Working with computers » How can I prevent symptoms? you vary your work posture. take a 'real' break after a maximum of 2 hours of computer work (10 to 15 minutes each time, ideally 10 minutes after every hour). A software programme such as 'CtrlWORK' can be helpful in this respect. User-friendly software obviously contributes to a relaxed work attitude and working posture. Do not allow annoyances about software problems to persist. Solve them! Use the settings options in the software to optimise your work. Not just the set-up of the furniture and equipment but also the working environment contribute to a relaxed work attitude. Examples are work space, lighting, no noise nuisance and indoor climate. is there little light contrast between the computer monitor and the surroundings? is it quiet enough and is the indoor climate pleasant? A poor positioning of the computer monitor, keyboard and mouse, chairs that are not adjustable in height, that do not provide support or miss arm rests, wrong desk height, and a cold work environment are all factors that increase the chances of RSI symptoms developing. A correct work station set-up that meets your needs might require specific aids such as a monitor stand, document holder, wrist support, extra support for the arms, foot support, et cetera. can be tilted on its own foot. is set up such that the wrists are straight. has buttons the fingers can rest on without these being pressed. its minimum size is that of the most frequently used documents. can be collapsed, is lightweight and is highly portable. if necessary has a document holder that is adjustable and stable. can, if necessary, be adjusted to your body size and work posture.